I’m tired of the media drumming up racism, especially when it isn’t there. 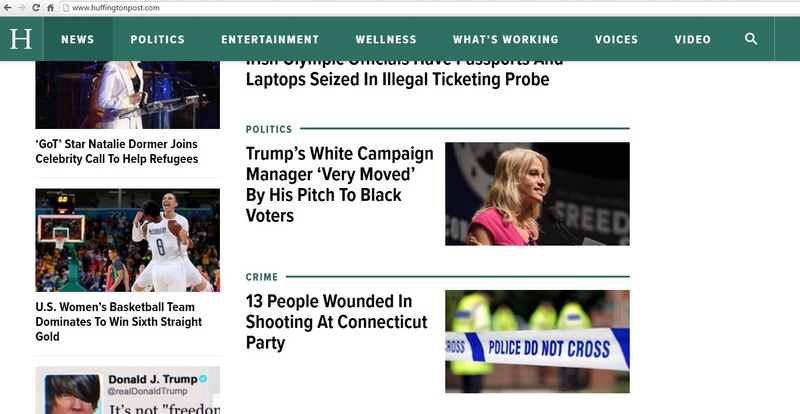 Take a look at a few screenshots from the Huffington Post. A headline on their front page reads, “Trump’s White Campaign Manager.” She’s white, so what? What does that have to do with anything? It’s just race baiting and it is disgusting. I’ve seen some really bizarre ads on their front page. Like take this one. It encourages users to download an app which promotes black businesses. Once again, why just black businesses? And here’s another article, about an Olympic athlete who was drunk after partying, celebrating after winning a medal, and at one point ended up breaking a few things in a gas station bathroom. He then had a confrontation with the police. What, he wasn’t shot down and killed? He wasn’t beaten to a pulp? 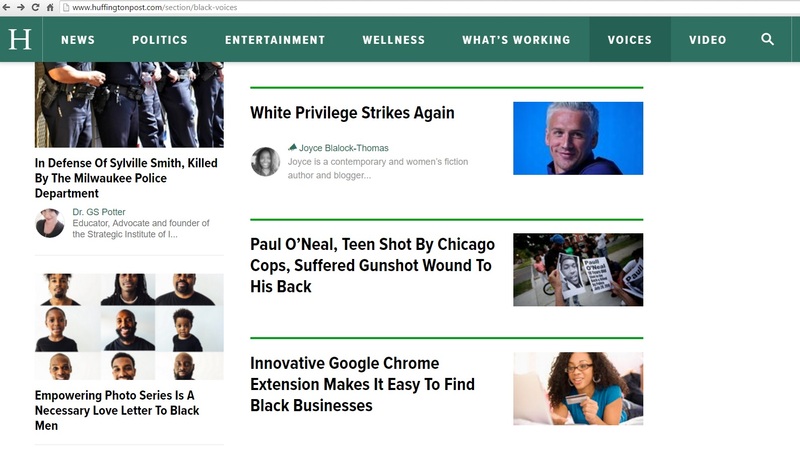 It must be white privilege! Seriously, give it a rest. He apologized, fine him, and move on people. Don’t make this some big racist ordeal. Or if you go on CNN these days, you’ll see articles like this. 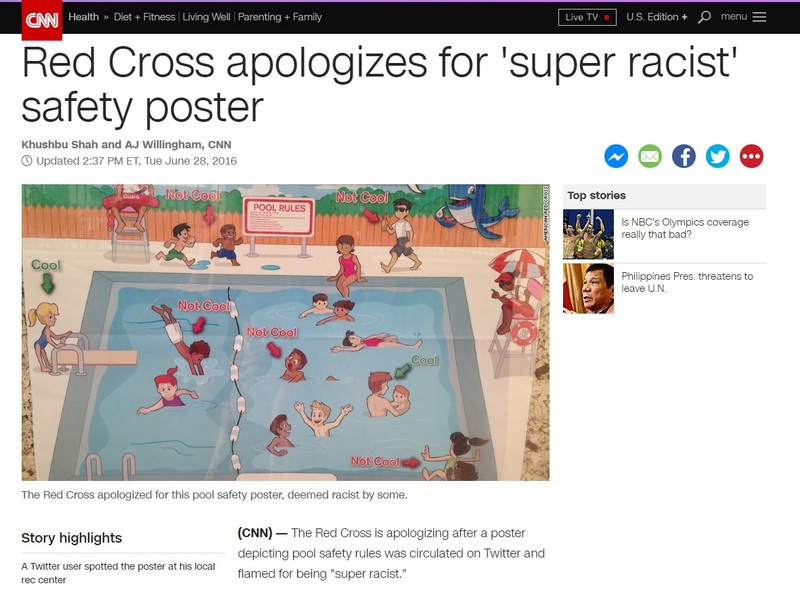 Apparently the Red Cross is racist because they issued this safety swimming pool poster for children. There is nothing remotely racist to that poster. This sort of stupidity is all over the mainstream media. I really wish more people were like Morgan Freeman. This is an English paper I had to write for a class. I was given free reign to write about anything I wanted, as long as it was related to my field of study. I chose to write about my struggle to escape solipsism, and my thoughts on whether or not the other people around me even exist. I took quantum mechanics seriously, and delved into the issue with full force. I basically end up concluding that you have to do some serious mental gymnastics to attribute any sort of “real” existence to an objective physical world, or to other people at all. I wanted to get into a lot more detail into these problems, but the paper had to be a relatively short length, so I wasn’t able to share everything I wanted to say. I’ll consider adding an addendum to the end sometime soon. Though mankind has been wondering about the true nature of reality ever since the dawn of civilization, modern conceptions of reality originate with Issac Newton around the year 1700. Newton’s picture of the world follows human intuition, envisioning space as an infinite three-dimensional box filled with chunks of matter which follow nice, easily visualized trajectories as time flows uniformly, moment by moment. All of this began to change near the dawn of the twentieth century as scientists were exploring the properties of atoms. In order to explain things such as why different elements give off distinct wavelengths of light, or why objects at a set temperature give off distinctive signatures of heat radiation, a new theory of matter had to be devised. This gave birth to the discipline of quantum mechanics, a set of mathematical tools to calculate how matter behaves on the tiniest scales. This theory went on to become the most successful tool in all of science, calculating the exact properties of atoms down to ten parts in a billion. However, this theory is also extremely bizarre. Its equations are no longer deterministic like Newton’s equations which give exact and precise results given a set of initial circumstances; these new equations are instead telling physicists that many different possibilities can happen at any given moment, though some outcomes are more likely to happen than others. Puzzled, physicists and philosophers began to invent interpretations as to what these equations are saying about reality. Now a century later, opinions and interpretations still vary. While a slim majority of physicists subscribe to the Copenhagen theory, which states that reality exists as a set of varied possibilities, described by the quantum wave function until collapsing down to a single possibility upon observation (measurement), this collapsing process is mystical, vague, and incomplete. By introducing a non-physical Mind which exists outside of space and time, this collapsing process can be avoided, offering a more elegant interpretation of the wave function, and why an observer experiences one particular reality as opposed to the many possibilities inherent to any quantum mechanical description of reality. However, this type of interpretation comes at a cost as it is extremely difficult to account for other sentient Minds without introducing yet another over-arching Mind which grounds the observers to a common reality. A central puzzle to the interpretation of quantum physics is that the equations describe many different possible realities on top of one another, smeared across space in a wave, yet when an experiment or observation is performed, only one reality is observed and different observers agree on this reality. This can be vividly illustrated in a thought experiment created by the Nobel laureate physicist Erwin Schrodinger. He imagined placing a cat and a vial of cyanide in a special box which is linked up to a radiation detector. If this detector is activated by incoming radiation, the vial is released and the cat is killed. He then imagined placing a radioactive atom near this detector. The key to this experiment is that to describe whether or not a radioactive atom, such as Uranium, will decay and release radiation requires quantum physics, and if one was to model and solve the equations for this situation, he would derive a wave function which would tell him that within a certain time-frame, there is a certain probability that the atom will release radiation, and a certain probability that it will not, but it will not tell him for certain what will happen. This same wave function would also include both possibilities for the state of the cat, which in the case of atomic decay would be dead and in the other case alive. While intuitively it would seem that the cat must either be dead or alive and cannot be both simultaneously, according to the laws of quantum physics, this is not so. A very strange thing happens when a person decides to walk up to the box and open it, looking at the cat for himself. One of the particular possibilities offered by the wave function is chosen through unknown means, and the other possibilities vanish into thin air. The cat is either dead or alive, based upon whether the uranium atom decayed or not, and there is no way of knowing the outcome for certain prior to looking for oneself. This rather mystical process, where one of the possibilities is chosen over the others, and all other possibilities disappear, is called the collapse of the wave function. Schrodinger’s thought experiment weighed heavily on Einstein, making him question whether there was an objective reality at all. Writing to Schrodinger he said, “You are the only contemporary physicist, besides Laue, who sees that one cannot get around the assumption of reality, if only one is honest. Most of them simply do not see what sort of risky game they are playing with reality—reality as something independent of what is experimentally established. Their interpretation is, however, refuted most elegantly by your system of radioactive atom + amplifier + cat in a box, in which the psi-function of the system contains both the cat alive and blown to bits. Nobody really doubts that the presence or absence of the cat is something independent of the act of observation.” (Maxwell). Einstein was perplexed by quantum physics, realizing that if it is true, it seems impossible for there to be an objective reality independent of that which is observed by sentient Minds, because the very process of observing and making measurements seems to bring a particular reality into existence. Most physicists largely ignore the problem of wave function collapse and choose to adhere to the Copenhagen interpretation which brushes the problem under the rug. This Copenhagen position was explained best by the physicist John von Neumann in his classic book Mathematical Foundations Of Quantum Mechanics. Von Neumann states that quantum mechanical systems must evolve by two separate laws. When no measurements are taking place, the physical system evolves according to the wave equations of quantum mechanics. However, when measurements are taking place, the system follows the postulate of wave collapse, and no longer follows the wave equations. (von Neumann). The central problem is that he never precisely defines what constitutes the “measurement” process, and the very idea of making a distinction between “measurement” and other activities feels clumsy and artificial. All measuring devices, even people themselves, are made of atoms and those atoms should obey the same laws of physics. Also, physics is a precise science, yet this method leaves it ambiguous as to whether a system should be collapsing or further evolving according to the wave equations. Physicist and philosopher David Albert of Columbia University addresses this problem in his book Quantum Mechanics and Experience, walking the reader through every known attempt to pin down what this measurement process actually is. He concludes by saying, “there hasn’t ever been so much as a shred of what you might call normal experimental evidence that the quantum state of any isolated physical system in the world ever fails to evolve in perfect accordance with the linear dynamical equations of motion. And so there seem to be a number of good reasons for looking for a different angle on this whole business.” (Albert). In other words, there is no evidence for this Copenhagen approach and its distinction between measuring and not measuring. There is also no reason to believe a wave function collapse ever takes place at all, and every attempt at even defining this ill-defined concept is problematic. A more elegant approach proposes that the Mind exists outside of space and time, that it is not subject to the laws of quantum mechanics, and that it picks out one possibility available from the wave function through something akin to concentration. This position is argued by Dr. Casey Blood of Rutgers University in his paper “A Primer On Quantum Mechanics and Its Implications.” In this view, there is no need for wave function collapse. The Mind peruses eternal, timeless quantum fields, where all possibilities are already pre-written, similar to movies which have been pre-recorded onto holographic plates. The Mind connects to certain field patterns it is compatible with, such as the human brain, and flies through these fields, playing them like a special projector which allows the viewer control over the direction of the movie and plot. A common objection to this type of dualism is that it is difficult to establish how a Mind existing outside of space and time can communicate with matter. However, in this case it does not need to. The Mind is only perceiving these fields and it does not ever communicate any sort of force on reality. As Schrodinger himself said in his book Nature and the Greeks, “The observing mind is not a physical system, it cannot interact with any physical system.” (Schrodinger, Nature and the Greeks) Another objection is that proposing such a Mind is unscientific because it could never possibly be observed. But consider that there are many things which are commonly agreed to exist which seem to exist outside of space and time. Take the color red or the number four for instance. They do not exist in any particular place in space and time. This also seems to apply to all subjective experience. A physicist or neuroscientist may be able to lay out a complex pattern of neural electrical signals and claim it is the subjective experience of listening to an opera, but if one directly compares subjective experiences of sounds with brain-matter pulsing with electrical signals, they are two entirely different things. There may be some sort of correlation between the two in time, but they cannot be one and the same thing. And more importantly, the world described by physics is nothing but mathematical vibrations and waves, and it is difficult, if not impossible, to say mathematical waves are equivalent to subjective conscious experiences. As Schrodinger once said in an article he wrote for the Observer, “Although I think that life may be the result of an accident, I do not think that of consciousness. Consciousness cannot be accounted for in physical terms. For consciousness is absolutely fundamental. It cannot be accounted for in terms of anything else.” (Moore) This view is bound to be unpopular with scientists who demand proof for all things by observation and experiment, but this then puts pressure on them to explain wave collapse; their vague conceptions of “measurement” are equally mysterious. But a central problem to this Mind interpretation of quantum mechanics is that it is extremely difficult to account for other Minds, as any other person experienced seems to be an illusory construct, similar to a character on a movie screen. To deal with this problem, Blood has to resort to introducing yet another Mind, an over-arching Mind. “Instead of each individual Mind being separate from all others, each Mind is a fragment or facet of a single overarching MIND. Each individual Mind is that aspect of MIND that is responsible for perceiving the state of the associated individual physical brain.” (Blood). Every individual must be aspects of the same Mind in order to be connected to one another in a common reality. They cannot co-exist in a common space and time, because there is no objective space and time, so this appears to be the only way to keep them grounded in a common reality. This view initially seems absurd, but a carefully prepared thought experiment can at least support the idea that these Minds truly are connected and are aspects of one and the same thing. Imagine two people laying down on an operating table. Their skulls are cut open and their brains are exposed. A mad scientist then begins to wire the two brains together through some very sophisticated technology, sharing the sensory inputs, memories, and emotions between brains. Before long, the two brains seem to operate as one, and it would seem reasonable that what was once two consciousness Minds has now been merged into one common Mind. At first glance, subjective consciousness between individuals seems to be an inseparable barrier, and many religious traditions assume that each individual has his own spirit, which is absolutely separate and fundamental. But this thought experiment illustrates that this unity of consciousness, which is always experienced in the singular, can strangely absorb other Minds when brains are wired up to share information. When Schrodinger was formulating quantum mechanics, he was heavily influenced by Eastern philosophy, where these ideas are not uncommon. In his book My View of the World, he says, “Vedanta teaches that consciousness is singular, all happenings are played out in one universal consciousness and there is no multiplicity of selves.” (Schrodinger, My View of the World) But even if this thought experiment helps to illustrate how this could be possible, it is still extremely confusing and unintuitive. All people are somehow one and the same Mind, interconnected in some inexplicable way, yet they are all still individually choosing an individual experience, and even more bizarrely, this Over-Arching Mind somehow brings individual Minds to agreement on a common reality; unfortunately, this unsatisfactory alternative to wave collapse is the logical conclusion one is led to when postulating Minds outside of space and time which must somehow agree on a common reality. Otherwise one falls into solipsism. The famed physicist Richard Feynman once said, “If you think you understand quantum mechanics, you do not understand quantum mechanics.” These strange equations describe physical reality with absolute precision, allowing the modern world to build much of its modern technology, including computers, all electronics, and even pharmaceutical drugs, yet physicists and philosophers have no idea what they actually mean. They describe a strange reality, where multiple possibilities exist at every turn, yet strangely, each sentient observer only seems to perceive one common reality which everyone he perceives agrees on. No matter which interpretation of quantum mechanics one takes, mystery and confusion are soon to follow, and thinking hard about these questions can easily make one lose touch with reality. It is not likely that the world will see a commonly accepted interpretation of quantum mechanics anytime soon because these questions get to the very heart of what the human experience actually is, and the second one thinks he has the universe figured out, it likes to put him in his place. Albert, David Z. Quantum Mechanics and Experience. Cambridge, MA: Harvard UP, 1994. Print. Blood, Casey. (2010, Jan 10). A primer on quantum mechanics and its interpretations. Retrieved July 27, 2016, from the arXiv database. Maxwell, Nicholas. “Induction and Scientific Realism: Einstein versus Van Fraassen Part Three: Einstein, Aim-Oriented Empiricism and the Discovery of Special and General Relativity.” The British Journal for the Philosophy of Science 44.2 (1993): 275-305. Web. Moore, Walter John. Schrödinger, Life and Thought. Cambridge: Cambridge UP, 1989. Print. Schrödinger, Erwin. Nature and the Greeks. Cambridge: U, 1954. Print. Schrödinger, Erwin. My View of the World. Cambridge: U, 1964. Print. Von Neumann, John. Mathematical Foundations Of Quantum Physics. Princeton, NJ. Princeton University Press. 1996. Print. Author JasonPosted on August 7, 2016 Leave a comment on Who Are You People?